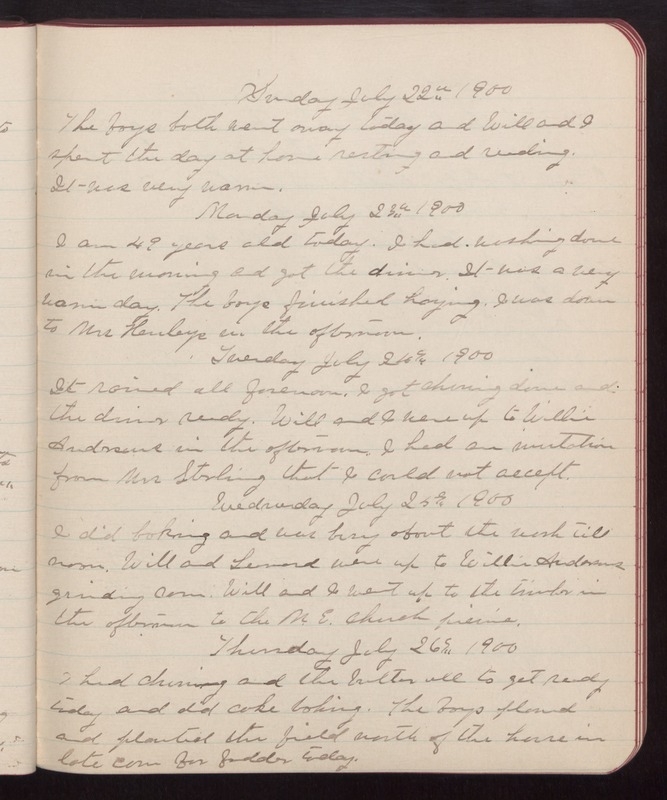 Sunday July 22nd 1900 The boys both went away today and Will and I spent the day at home resting and reading. It was very warm. Monday July 23rd 1900 I am 49 years old today. I had washing done in the morning and got the dinner. It was a very warm day. The boys finished haying. I was down to Mrs Henleys in the afternoon. Tuesday July 24th 1900 It rained all forenoon. I got churning done and the dinner ready. Will and I were up to Willie Andersons in the afternoon. I had an invitation from Mrs Sterling that I could not accept. Wednesday July 25th 1900 I did baking and was busy about the work till noon. Will and Leonard were up to Willie Andersons grinding corn. Will and I went up to the timber in the afternoon to the M. E. Church picnic. Thursday July 26th 1900 I had churning and the butter all to get ready today and did cake baking. The boys plowed and planted the field north of the house in late corn for fodder today.